Few maps can claim a legacy quite like Tides of Blood. As well as being a respected and well-received map in its own right, ToB is also cited as an inspiration for many of the best AoS maps ever made. It enjoys the rare and deserved privilege of being enshrined in Blizzard's official Hall of Fame, among only five other maps. The story started in 2002, in the custom maps scene for Reign of Chaos. Back then, the game's World Editor was a crude tool: designed primarily for building campaigns, and not much else. There was no way to edit abilities, buffs, the maximum hero level, or indeed touch most data fields. Still, Warcraft's World Editor was a much more elaborate tool than the Starcraft: Brood War editor used to develop the genre-defining Aeon of Strife. With what Reign of Chaos had to offer, fans of Aeon of Strife were eager to experiment with new ideas, and present their own twists on the genre. Multiplayer maps at the time were often played online and distributed freely. Fan-made tools to "protect" a map (to stop other users from editing it) were years from completion, so at this stage anyone could take a map that they had played, and start editing it themselves. Much like in Starcraft, the mapping community was very collaborative, even if not always consensually. Over time, from a primordial soup of different developers with different ideas, emerged AoS Epic (No_Pants, et al., 2002) a map which had accumulated nearly all of the features which were soon to define ToB. named after yourself, and placing it on the map to mark your contributions. Self-described as "The best of all AOS concepts consolidated into one map and carefully balanced", and with at least 5 potential authors on the earliest version I could find, it's quite clear that the AoS Epic series was a communal effort. With the looming release of Warcraft's Frozen Throne expansion, a new team of custodians for those concepts stepped forward. ToB's developers managed to obtain early access to the improved editor which would release with the Frozen Throne expansion, and used its powerful features to get a head-start on their version of the AoS Epic series, which would be called "AoS: Tides of Blood". By the first day of Frozen Throne's worldwide release, Tides of Blood was ready, and immediately started being played and spread across Battle.net. As one of the first maps to showcase the new editor's capabilities, it quickly grew in popularity, to the point where not only was it the most popular AoS on Battle.net, but the most popular custom map outright. Each team has three bases: a main base, a large outpost, and a small outpost. The small outposts contain a Keep which spawns troops, a fountain of restoration which provides healing, and some defensive towers. The large outposts additionally have a building where Mercenaries can be hired, and slightly better defences. The outposts are strategically important, because once a Keep is destroyed, there is no other way for that lane to produce troops. This loss in production allows enemy forces to march unimpeded upon the main base: a major liability in the long-term. It's possible for losing teams to "backdoor" an enemy Keep to try and even the odds if they've lost one of theirs, but succeeding is no easy task. Off to the sides, each team also has a Gold Vault, isolated from the lanes and well-protected by towers and troops. Once a Gold Vault has been destroyed, the owner's team will no longer passively generate gold over time. Gradually, this will create an economic gap between the teams, until both vaults have died, or one has essentially secured victory. The vaults are well-defended by towers and a stationary cohort of troops, and are almost always tackled as a team objective. The map features two Waygates, which teleport units from their position to the centre of the map. This teleportation is one-way only, but a valuable asset for the team in control of the mid lanes. While the map is generally open-plan, the side lanes are relatively isolated: only one indirect path allows heroes to move from the center to a side lane without passing through either a friendly or enemy outpost. The side lanes also have bridges which bottleneck troops, and are a favourite spamming-ground for area damage heroes. The bridges were later widened to make pushing against area damage more practical. A variety of units can be hired from the Mercenary buildings. As well as basic melee and ranged units (which can ferry items, defend, or help secure last-hits in lane), each team has access to its own caster unit from regular Warcraft 3. The Alliance Sorceress can turn any friendly unit invisible, or use slow/hex on enemies, while the Undead Necromancer can raise skeletons, increase the attack rate of an ally, or slow an enemy. These units are one of the few asymmetries in the game, but are an important one. Early-game, invisibility is much more valuable than attack rate. The Alliance team will buy a sorceress or two, and have them take a waygate to the centre of the map. The sorceress will then be stationed there, both to provide vision in case the Undead try teleporting in behind the front lines for a gank, and also to cast invisibility on-demand to help set up kills on the mid lanes. Once a sorceress is low on mana, a new one will typically arrive via waygate, while the old one walks back to base to replenish its mana. The casters can be cycled in this way to maintain uptime on their abilities, as well as form a supply chain for items and consumables. A sorceress at mid, applying invisibility to heroes for a gank. Later in the game, true-sight items remove some of the power of invisibility, while attack rate is still valuable in many situations. Another unit available for hire is the Lead Zeppelin. This unusual unit is a ToB exclusive, even after years of successors. Like the classic Goblin Zeppelin unit available in regular Warcraft, Lead Zeppelins function as flying transports, which means that allied units may be loaded into them, and unloaded at a later time. A loaded unit is essentially "off the map" by being hidden inside the transport, meaning it can't take damage, attack, cast spells, or otherwise interact with the rest of the game. It's possible to micro transports to save low-life units by loading them, but if a transport dies, so too will everything inside. Unlike the goblin version, the zeppelin in ToB is made of lead, and as such moves at an abysmally low speed. Instead of flying to their destination, Lead Zeppelins prefer to use the ability to Warp to any friendly unit on the map, which has a 2 second channel time, on a 90 second cooldown. So heroes can hop into a zeppelin, warp, and disembark somewhere else on the map. What makes this interesting is that these zeppelins can carry up to 6 units. So rather than each player buying their own zeppelin and warping on their own, it's much more effective to work and move as a team. The 90 second cooldown on warping makes single trips wasteful: instead it becomes natural to coordinate your movements with your team to make best use of the resources available. Zeppelins can also store units like Sorceresses or workers, to keep them safe and mobile. But in order to share zeppelins, players must first share control of their units with their allies. This enables boarding friendly transports, but also allows players to control each-other's heroes. That's a big leap of faith in a largely anonymous online multiplayer game, but in ToB's community, it worked. Without shared control, individual players would have to spend a huge sum of gold securing their own transport and invisibility. The team which shares resources, can cover those needs with 1-2 zeppelins and sorceresses, and then invest in other valuable team assets. We've mentioned earlier that ToB showcased some of the editor's new capabilities. Among these was raising the maximum hero level from 10 to 18. It's no surprise that just about every AoS map since has done similarly: the AoS format involves much more hero combat than ladder play, and 10 levels wasn't granular enough to give players a sense of progression throughout a match. Another subtler choice was to use almost exclusively models from the new expansion for the heroes, to ensure players would be seeing something fresh. The emphasis on visuals stuck around too: as the project grew, various artists, particularly Jacinthe, began contributing assets to help make the game look better. This helped to grow the player base, as new players were attracted by the custom artwork, and stayed for the distinctive gameplay. The design direction for ToB's heroes remains a strong point of the map. While many of the heroes themselves were either taken from ladder or very close to it, this was nothing unusual for a map of its day. What stands out was that ToB had a total of nine heroes per team, and stuck with that number. 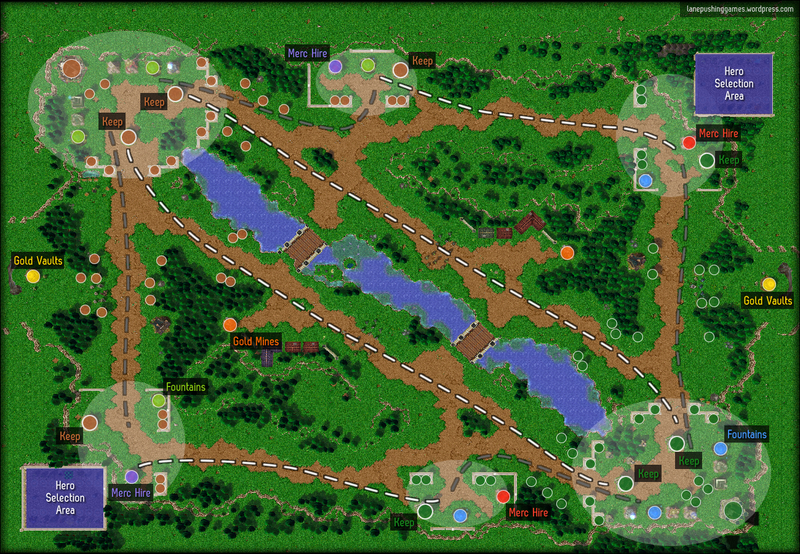 (As with almost all AoS maps around this time, the two playable factions had distinct hero pools to choose from.) For comparison, other maps typically had double the amount, often with identical hero skills appearing on several heroes. The icons along the bottom rotate, eventually settling to display which heroes the enemy team has picked. The advantage of a smaller cast was not only the practical concern of having less content to implement and balance. With less competition, the heroes could occupy more distinct roles, and the relatively few tweaks to abilities were sufficient to make sure that no hero could be effective at too many tasks. An example is the Warden, a highly mobile hero from Warcraft III with low-cooldown damaging abilities: great for harassing and chasing heroes. Her Warcraft ultimate is a powerful summon and a potent siege tool. While ToB's Warden shares the first three skills, her ultimate lets her instantly teleport to any allied unit: securing her as the most mobile hero in the game, but meaning she has to rely on her allies to help take bases. These well-defined roles allowed players to more quickly settle into an understanding of how each hero should be used, and its overall role within the team. One of my favourite quotes about ToB describes a hero, the Scythian Maiden, as "the backbone of early pushing for the Alliance". That is such a strong statement about a hero's purpose: and with that clear purpose established, players can immediately begin thinking about how to put her strengths to use. Contrast this philosophy with most heroes in Warcraft III. Like the Warden, they have a diverse array of skills. They are designed to avoid falling into a single role, lest the shifting meta of an RTS decree them too easily countered. In a controlled environment like Tides of Blood, with its limited number of matchups, having fixed roles becomes a more viable design choice. Heroes always have relevance because they are uniquely strong at what they do. While this removes a layer of "which hero to use, in which way", the simplification proved itself valuable by accelerating player understanding. In Part 2, we'll take a further look into ToB's heroes, and look at some more of the features which contributed to the game's success. Arise, arise! Fighters of Terpentin! Lane-pushing games are best known as 5v5 matchups, but over the years there have been plenty of maps trying out different configurations. A continuation from Part 1, exploring items, roles, and loadouts. PerSonas and its sequel Arkana are a pair of maps which both implemented a very clever mechanic called the perSona switch.